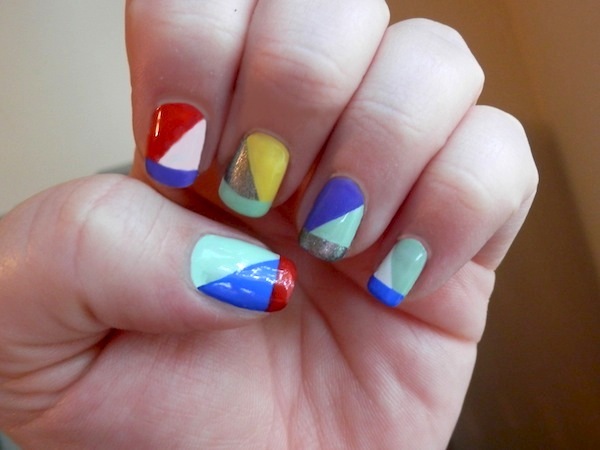 Nail art newbies - don't be intimidated by this look! It is deceptively simple and easy to replicate. The only thing you really need is the time to let everything dry well in between coats, but even those of us with shaky hands or less than stellar art skills can create this look. You can also get super crazy and draw a thin black outline between the shapes with a skinny nail art brush or add complementary colored polka dots to some of the sections. 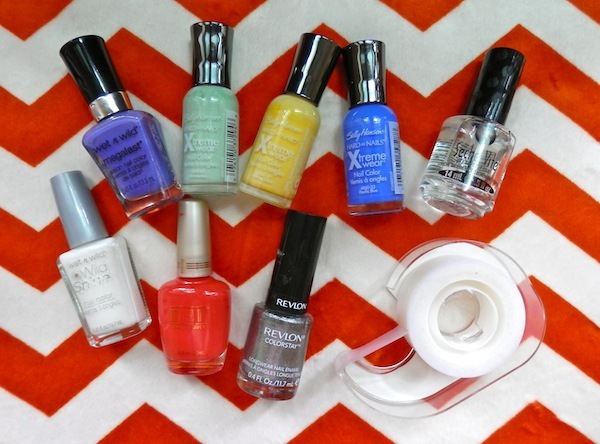 Paint a base coat(s) of polish on each nail. I worked in a random pattern, but used mostly the lighter colors for the base since it's easier to paint darker shades over light rather than the other way around. When the base coats are completely dry (I mean it, no cheating! I waited a couple of hours), place a strip of Scotch tape diagonally across a nail and press it gently to secure. I always stick the tape to the back of my hand first to remove some of the stickiness. Use another shade to paint on the area that isn't taped off. Slowly remove the tape. It's fine to do this before the nail polish dries. 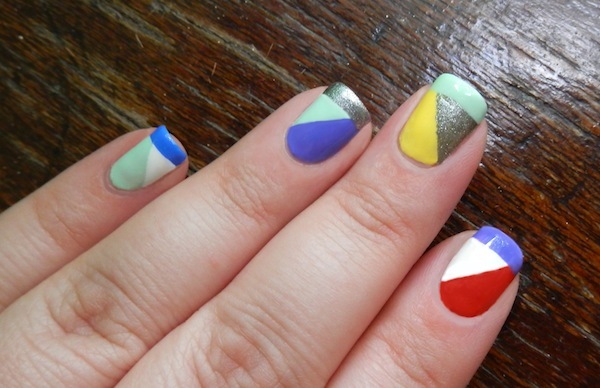 Repeat these steps on the rest of your nails, maintaining a random color pattern. 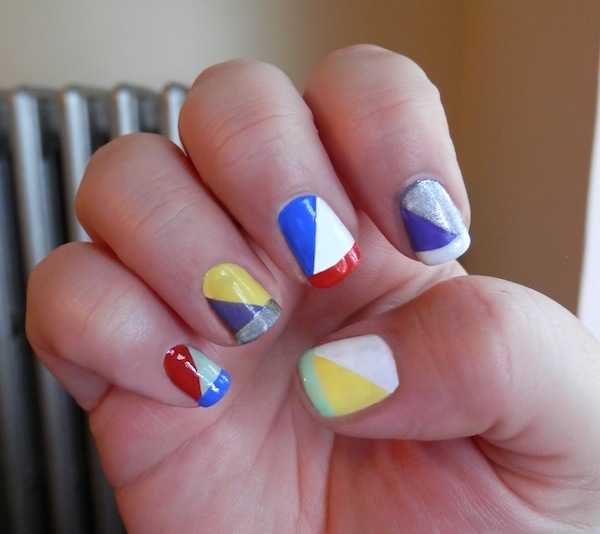 You could stop at the last step, but to add a little more of a geometric vibe I painted colorful French tips on top of the diagonal sections. To do that, make sure that the nail polish is dry (again, really dry) and put a strip of tape across the tip of your nail, leaving a small section untaped. Fill in that untaped area with another color of nail polish. Remove the tape. You can also freehand the French tips if you feel up to it, which is what I did for most nails when I was too scared that it would mess up the existing nail polish. 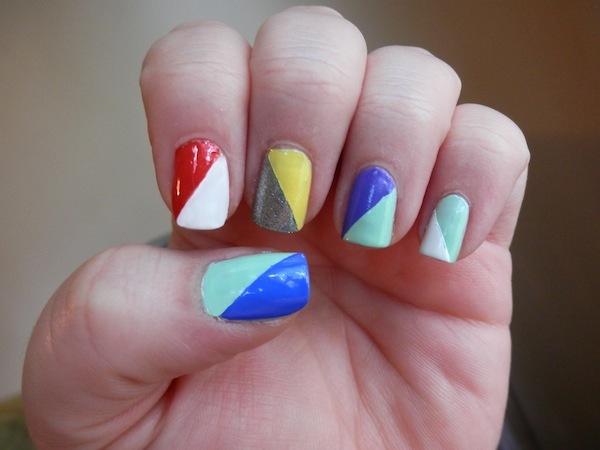 Repeat on all nails and set with top coat to complete the multicolor geometric nail art. I like using a lot of colors that are kind of different to create a true randomness, but feel free to try this with a more matchy-matchy palette or even a monochromatic scheme. I really like the un-matching nature of this design and color scheme for some reason. I usually tend to stick to more traditional schemes in my nail art and I definitely don't usually use this many colors in one look. Doing this pattern at random resulted in some unusual color pairings, and I actually ended up loving the mint green, yellow and silver combo the best. I would probably not have paired these before this experiment, but now I'm working on a whole nail art look based on just those shades. 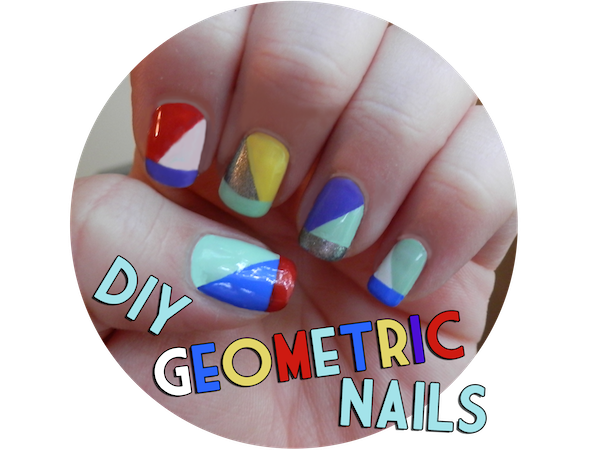 Do you like geometric nails? 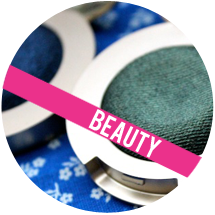 Are you intimidated by creating any kind of pattern or art on your nails? 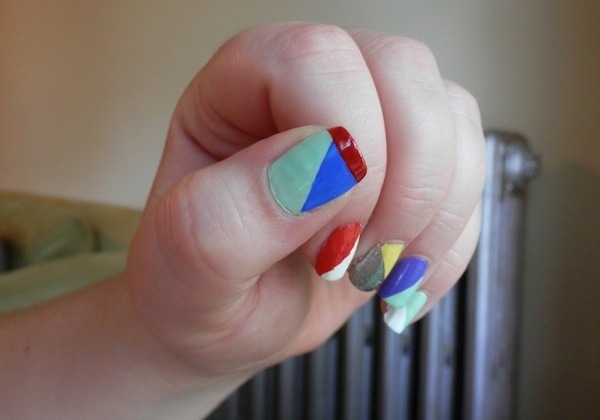 Do you love Scotch tape as a nail tool as much as I do? And following you on Blogger, btw! I love that you used very affordable nail polishes (instead of those Deborah Lippmann polishes that go for $17 a pop and the like) to achieve this super chic nail design! Great tutorial! Very creative! Thanks for sharing. Also, thanks for your lovely comment. 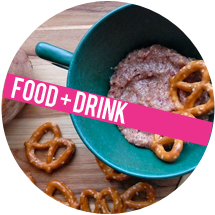 I like your blog, I'm following you on GFC, I hope you do the same to stay in touch. Have a sweet day! 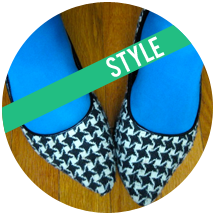 Sorry I meant I followed you on bloglovin.